For years, falafel was Israel’s iconic food, its global culinary ambassador. But in recent years, another Israeli dish with working-class roots has become a major player in the game of street-food diplomacy: the savory tomato and egg mixture called shakshuka. 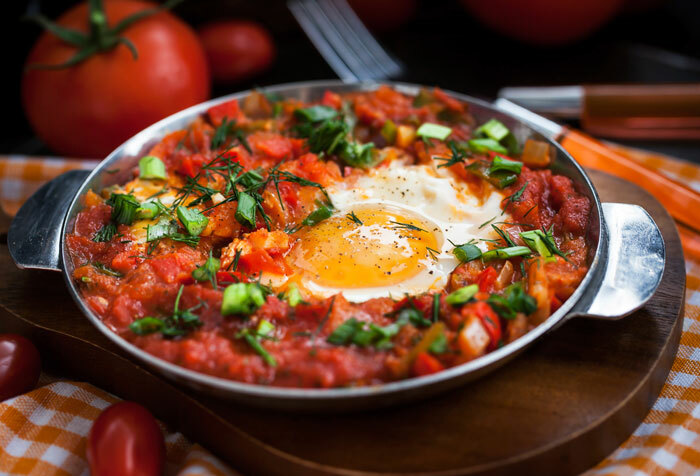 Shakshuka as we know it today was born in North Africa, though its origins go back to the Ottoman Empire, when a vegetable and meat stew called saksuka was popular throughout the Arabic-speaking world. Over time, according to the late Gil Marks in The Encyclopedia of Jewish Food, ingredients from the West—such as tomatoes and peppers—were introduced to the stew. According to Marks, saksuka got a Jewish twist when North African Jews eliminated the meat to make the dish pareve, and, in Tunisia especially, where Jewish citizens were known for their egg dishes, eggs became an important, protein-contributing component. Across North Africa, different regional variations flourished: Some varieties were spicier than others, some included a wider range of vegetables, and some were served over bread. When North African Jews began immigrating to Israel, they brought with them the hearty dish (whose name is said to be an onomatopoeia meaning “all mixed up”). Part of its appeal was its affordability: For struggling immigrants in a fledgling country, a meal of eggs, tomatoes, vegetables and bread was an easy option. In what we now know as the classic Israeli version, eggs are poached on top of a mixture of tomatoes that can include onions, peppers, garlic and spices. In Israel’s early days, shakshuka proved uncomplicated and inexpensive for the military to serve it en masse to soldiers, says food scholar Dalia Carmel, which contributed to its pervasiveness. Plus, it was versatile enough to be breakfast, lunch or dinner. It’s not just home cooks who are hopping on the shakshuka bandwagon. Even in the shellfish paradise of New Orleans, Israeli-American chef Alon Shaya, who won a prestigious James Beard award this year for best chef in the South, sells the tomatoey, eggy concoction at his restaurant, Shaya. And earlier this year, three Israeli friends opened up The Shuka Truck, which prowls the streets of New York hawking four different versions, served either in a bowl or as a sandwich. At first, says co-owner Josh Sharon, “people really didn’t know what shakshuka was,” but the masses seem to have caught on by now. Despite its ever-growing fan club, like most things associated with the Middle East, shakshuka sometimes bubbles with controversy. Last year, when The New York Times posted a recipe for shakshuka on its Facebook page with an accompanying article emphasizing its ties to Israel, the comments section filled up with statements like, “So its not only land grab…now its food grab as well…I don’t know what will be left of the arab culture after Israel claims everything for itself.” [sic] Like hummus and falafel, shakshuka carries, for some, a sense of Israeli appropriation—claiming credit for a food whose history is more Arab than Israeli. Of course, like much else in the Middle East, its origin is subject to contention, since people all across the Levant ate similarly. Because Israel relies on the crops that can grow in the Mediterranean climate, and has a significant population that “immigrated to Israel from North African countries, it stands to reason that the same dishes would be close to their heart and they would embrace them,” says Raviv. Arguments aside, one of the things to love about shakshuka is its seemingly endless adaptability. Don’t like bell peppers? That’s fine; leave them out. Want to add goat cheese? Sure, why not? Green shakshukas may include spinach, leeks or asparagus; white shakshukas might incorporate cream, cheese and mushrooms. The vegetarian-averse can add beef sausages. Spices and herbs are also variable—cumin and paprika are commonly considered basic ingredients, but some recipes call for cinnamon, coriander, saffron, rosemary, parsley or thyme. Heat the vegetable oil in a deep skillet over medium heat. Stir in the garlic, onion, and bell pepper; cook and stir until the onion has softened and turned translucent, about 5 minutes. Add the canned tomatoes, paprika, cumin and jalapeno; stir. Simmer for about 25 minutes. Crack an egg into a small bowl, then gently slip the egg into the tomato sauce. Repeat with the remaining eggs. Cook the eggs until the whites are firm and the yolks have thickened but are not hard, 2 1/2 to 3 minutes. If the tomato sauce gets dry, add a few tablespoons of water. Serve with bread. This was delicious! Loved it! Do you have nutritional facts for this dish?